Is Gisele Bündchen set for a comeback in 2018? She was just unveiled as one of the faces of Versace’s new campaign, posing alongside fellow supermodels, and is now Vogue Japan’s cover girl for February 2018. We needed a little “Queen Gisele” after the magazine’s dull Lily-Rose Depp cover last month. Showing everyone how it’s truly done, Gisele works her effortless magic in the newsstand cover (below), photographed by Luigi & Iango. Gisele was styled by Patrick Mackie for the occasion and wears a bejeweled Christian Dior bodysuit (which might look familiar next to this at the newsstand). Despite the gorgeous newsstand cover, our forum members were intrigued by something else. “Wow, that second cover (below) is a radical departure from what Vogue Japan typically offers. She looks beautiful there, too! I love them both – but of course, I am a massive Gisele fan and so am probably biased to some degree. It’s wonderful seeing her each time,” raved happycanadian. “I absolutely love it! Both shots are gorgeous! So happy she’s back!” declared SicKie. “She looks SOOOOOOO YOUNG!!! OMG I thought it was a picture from 1999 like… amazing!!! 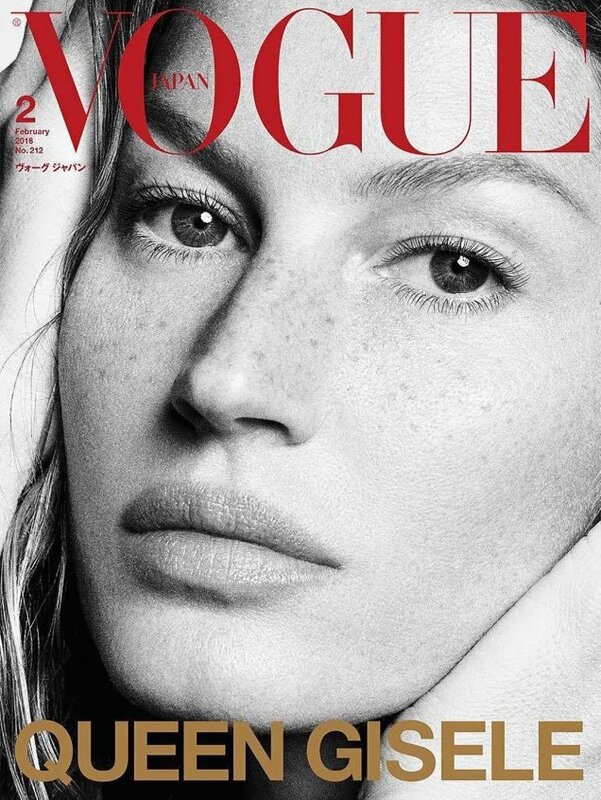 I love seeing her on Vogue covers over and over again. Such a pro!” Bertrando3 exclaimed. “The date says 2018, but the Photoshop on the face says we’re back in 1998,” snarled tigerrouge. Srdjan couldn’t have been more thrilled with the outcome. “Honestly, nothing to complain about. She’s just magic,” he stated. “Now this is how you start the year, hope it means more of her on covers in 2018! Everything about this is perfect,” voiced Miss Dalloway. See more from Gisele’s Vogue Japan cover shoot and let us know what you think here.